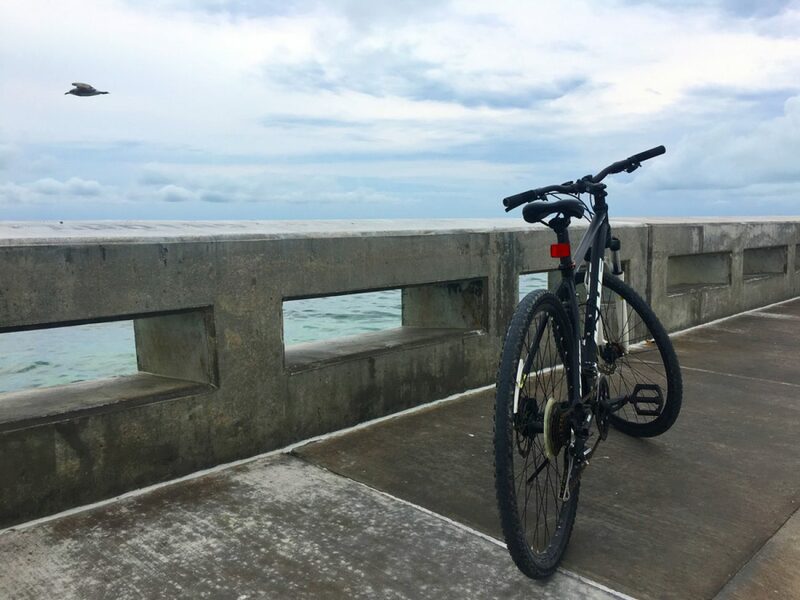 While looking for fun things to do around the Florida Keys, we came across Lloyd’s Tropical Bike Tour. Since we all love riding our bikes it was a no-brainer for us. We quickly booked our tour and made the drive down to Key West. Lloyd is not a historian so if you’re looking for a tour that tells the history of Key West, this may not be fore you. Instead, you'll find yourself laughing often at his jokes and having a blast riding the quiet streets of Key West. It is the easiest ride, as the highest point there is just 18 feet above sea level. We started off our tour with this tropical rendition of Jingle Bells. Lloyd is quirky and has a bit of a weird sense of humor which is exactly what makes this tour so fun. We stopped at this massive cactus and we were able to sample our first Prickly Pear! The kids even tried and it we were all surprised how good it was. We rode to the Rasta Tree. Lloyd showed the kids the real way to open a coconut using his trusty machete. They have wanted to drink from a coconut since we got here so now was their chance! Too bad none of the kids liked the taste of the coconut water! He split the coconut in half so that we could feed the Conch Chickens that were running free all over the place. Riding a bit more, we ended up at the Key West Wildlife Center. What a cool little place. Locals who don’t enjoy the Conch Chickens all over their yard will set traps for them, then bring the chickens back to the Wildlife Center where they are taken care of until they have a good amount of chickens and then they are taken to an organic farm and used to fertilize their crops. They keep their bug population down and live a great life on the farm. The best part about this place was when Lloyd became known as ‘bird man’ and called in the Ibis! Watch this video and you’ll know what I am talking about! After he let the kids feed the Ibis, we were able to make our way to the pond where we fed the turtles. Before we left the Wildlife Center, we met Charlie. He is a massive rooster and used to be someone’s pet until he started fighting with the Conch Chickens and causing problems. His owners had to bring him here due to his fighting. He now lives a great life at the Wildlife Center where he is taken care of really well. After feeding the fish we made it to the Key West Garden Club. It is actually an unfinished Civil War fort that was saved from a wrecking ball by the Garden Club and is made up of volunteers - it has the most beautiful and interesting plants and trees. It would be a great place to sit and just relax away from the hustle of Mallory Square and Duval Street. Admission is free and they do have a donation box. Again, Lloyd's weird humor always kept us laughing. Lloyd really made an effort to include the kids everywhere we went. He even showed them the almond tree and how to open it up to eat the nut. The garden was just beautiful. If you are in Key West, we strongly suggest you make a trip there. We ended up back where we started and the whole tour was around 2 hours. The kids had so much fun. The younger two only wished they could have rode their own bikes, but the rule for the tour is you have to be 7 or older to ride your bike. Which we totally understand after riding the streets in Key West. Our younger two probably would have gotten run over. We were a bit worried that the kids may not enjoy the bike tour but Lloyd made sure to include them on every stop and really focused on the kids and made it super enjoyable for them. They all said they had a blast! I do have to brag for a minute on Lloyd. At one point early in the tour, Ada was bitten by fire ants and was crying hysterically. Lloyd made a call to his brother's house and we all rode our bikes there where Ada was treated for her fire ant bites. They took us into their home, used rubbing alchol on her bites and then picked us aloe out of their garden to ease her pain. That is going above and beyond if you ask me and Ada sure was grateful after that painful attack. Poor kid, she has the worst luck with bugs. So, if you find yourself near Key West, we strongly suggest you book a tour with Lloyd. You won't be disappointed!